Bracelets have long been used by women as a way to attract the male gaze to dainty feminine wrists. As a decoration bracelet is one of the best gifts. If you store the jewelry you already not attracted doesn't matter. 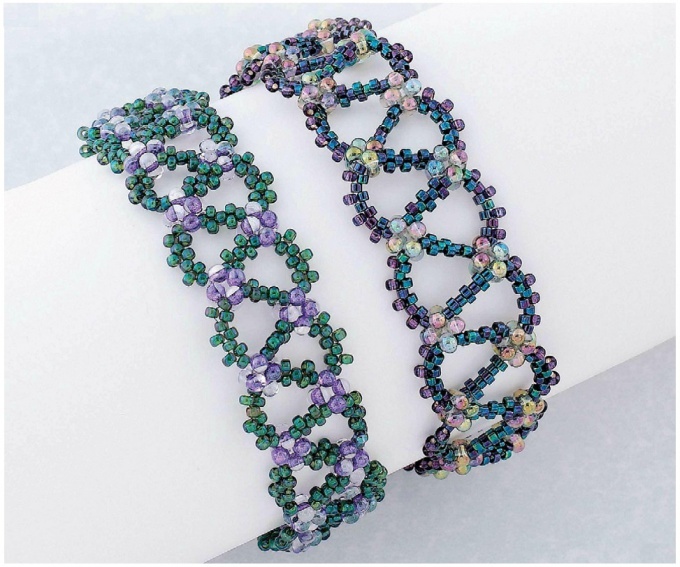 With the help of beadwork you can create a unique bracelet for every taste and age. For making jewelry you will need: beads of 2-4 flowers, fishing line, tweezers, clasp. To not bore you, it is important to organize the workplace. For convenience and to avoid the appearance of tired eyes, lay on the smooth surface of the table solid fleecy fabric soothing colors. So the beads will not slide, and the material will be clearly visible. As a box for storing beads, you can use the left or glue rows of matchboxes to get a few offices. The best lighting is frosted lamp up to 40W. Take beading tweezers. By making the appropriate number of laps, flip the chain so that the ends of the line are on the bottom. Select the desired number of beads of another color and start weaving in the opposite direction. The left end of the line in a top-down pass through the third from the base of the bead left of the last lap, and the right end - through a symmetrical bead on the right. Pick up the left thread 1 bead, and on the right – 2. Miss the left thread through the top bead on the right thread and tighten. String on both threads one bead and pass downwards through the holes of the respective beads of the lower circle. Dial on both strands and 2 beads and pass down through the top bead of the second circle. Repeat this technique along the entire length of the bracelet. The colors you can think, initially drawing the layout of the future bracelet on paper.